Lots and lots of families travel with grandparents, kids and grandkids but it can be tricky with every age group having different needs. Today, I have a plan for you to help you make plans that will appeal to everybody in the family. Let's take a look at when to go, which hotels work best, where to eat and how to tour together. Although you may be bound to school schedules, be sure to consider temperatures, especially when older family members are on the trip. If your school's spring break happens to be scheduled separate from when Easter falls, think about visiting then when the temperatures are cooler. Use my crowd calendar to help you pick a date. Ft. Wilderness campground - you can rent a cabin, bring an RV, or camp in a tent at Ft. Wilderness campground. I love this option for large families due to the activities that are available (horseback riding, campfires, etc. ), having 2 dinner shows located here (Hoop-Dee-Doo Revue and Mickey's Backyard BBQ) and the ability to kind of get away from the hustle and bustle of Disney to spend time together. Art of Animation suite - if your group has 6 people or less, a suite at Art of Animation might be ideal since it has 3 beds, 2 full bathrooms and a kitchenette. The theming is very colorful and immersive which kids love and grandparents may enjoy getting to see the little ones having so much fun in that environment. For people wanting to stay off-site, I like using VRBO.com for condo and house rentals. You can get a lot of space, cook some of your own meals and maybe even have your own pool this way. Tip: if you're staying at a hotel in multiple rooms, I suggest calling Disney and having them link give you a "travel with" number which will link your reservations, and allow your rooms to be assigned before other people, increasing your chances of having rooms close together. I always recommend that people decide where they'll eat after figuring out where they'll be each day. Here are some places that often please people of all ages. 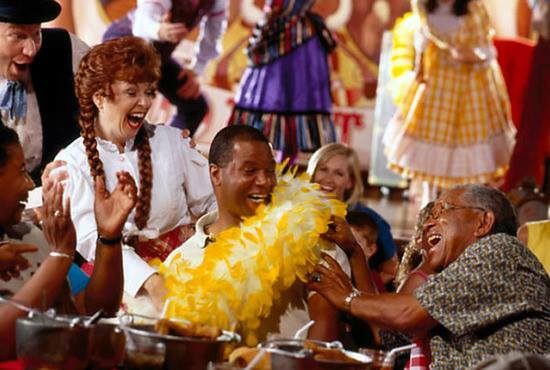 Hoop-Dee-Doo Revue - this is a dinner show located at Ft. Wilderness with corny humor and home-cooked food served family style. I'd recommend doing this at the end of an Animal Kingdom or Magic Kingdom day. I always highly recommend that groups consider not touring together because it's really difficult to move a big group through the parks. However, if you want to tour together, I'd suggest only staying together for a part of the day (like through lunch) and then separate for the rest of the day. 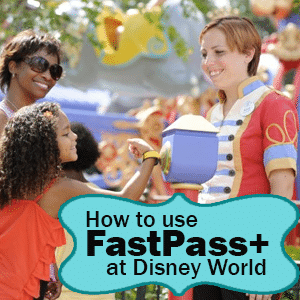 Make sure your whole party is linked within your My Disney Experience accounts so that when it's time to make FastPass+ reservations, one person can make reservations for everybody. You can use my touring plans for all 4 parks to help decide how you want to tour with your group. Do you have other ideas or questions on visiting with multi-generational groups? I'd love to hear your thoughts in the comments. 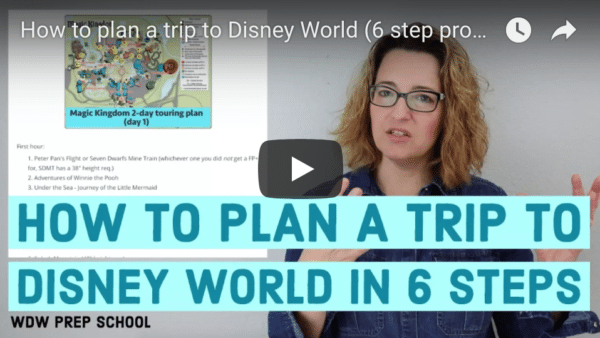 These are great tips if you are looking to go to Disney World. I’m thinking about making my way out there some time, but I haven’t quite figured out when I should go. I’ve read before that it is wiser to go during the winter months. I mean, after all, it is warm basically year-round in southern Florida. We have done 3 trips with 3 generations (6 adults, 6 kids). To save money we get 3 rooms at Pop Century and book two of the kids with grandma and grandpa (although the kids alternate as to who really gets to sleep in the room with us). We got the Memory Maker and after 10 days, we had over 900 pictures!! It was amazing. We split up most of the time, but got together for some of the meals and for the parades and bigger shows. When the little ones were tired, someone was always glad to take them back to the resort to either swim or nap. We texted each other all the time to figure out where everyone was going. I can’t wait to take them all again. My family of 3 is planning a trip with our best friends (family of 4). Because we both have children, we are seemingly unable to link al of our accounts for fastpass+ reservations. Any suggestions on how to get around this? You should be able to link everybody. If you’re unable to get it linked, give tech support a call at 407-939-4357. All of our trips to Disney have included my parents. All generations stay at the same hotel and ask for adjoining rooms. The grandparents take one of the children with them so the other child who is older and bigger can have a bed to himself. We have also stayed at the Windsor Hills community and shared the house. We each pay for our own rooms and tickets and food. They help by taking the youngest to ride his rides and we can ride the other rides with the older child. They love experiencing the Disney adventure with the family. Great tips. Some of these I did do (memory maker – loved it) and others I wish I had done (have the grandparents rest with the younger kids). We got too wrapped up in trying to do everything and the oldest and youngest in our group became too exhausted to enjoy much of anything those last couple of days. Bummer. I just got back from a 4 generation trip. Great-grandmom (74) Aunt & Uncle (40s and one in a scooter), baby cousin (8), Grandmom & PopPop (50s and one in a scooter), Me and my husband and two girls (11 and 8). We ate our ADR’s together which was a mix of character meals and nice table restaurants which gave a little something for everyone but it was very rare that we toured the whole day together. The uncle and great-grandmom always needed a mid-day nap so we learned to do as much in the early morning and late evenings. We used mid-day to break for the pool. Staying on property was the best for us because it was easy to go our own ways when needed. Baby cousin got sick twice so his mom could easily get him back to his room at Fort Wilderness while I took my children for a swim break at our resort, Caribbean Beach. We are planning a 4 generation trip the week after Labor day 2015. I have no idea where to begin. We will have Great grandparents (73 and 75, and Dad is in motor wheelchair), grandparents (53 and 55), daughter(23), grandson (5) and granddaughter(4). We may have more but they have no commited as of yet. I want to stay in park, free dining, character meals, the whole Disney experience for this first trip. HELP!!!!! I am a first timer going to the world in September with 2 kids (4&2), my wife, parents, brother and friends. Total of 11 in all. I have spent a lot of time in the past 6 months trying to learn as much as possible to put together a descent plan. 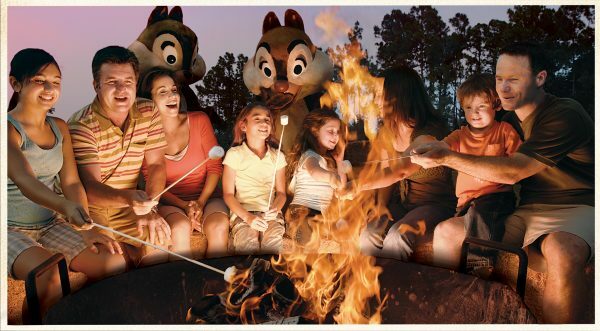 The big group will be at disney for a week and my immediate family plan to spend some quiet time for another week. I am working on fastpass+ plans. I am on charge of fastpasses for all. I have entered the names of everyone in my disney account. I haven’t sent the link email however. Is that something I need to do or can I get the fastpasses assigned? Many in my group don’t have email. Is there any way to know if I have them set up so I can reserve passes in their name before the 60 day window opens? Shannon thanks for all your wonderful insight so far. I look forward to every weeks podcast and read everything you write or pin. You are definitely one of the rock stars of the disney podcast arena. If everybody is in your My Disney Experience account and their tickets are loaded there, you don’t need to link to them as you’ll be able to manage everything for them from your account. We stayed at Pop Century with a party of seven (3 rooms) and ask for ajoining rooms for my mother and my brother with his family. It worked out great because the little girls got to either go to grandmas and stay overnight or have the door open to increase the space between the two rooms. My husband and I were right next door. It worked wonderfully. We did get the preferred rooms. 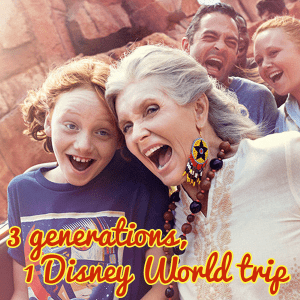 I am also a 73-year 0ld grandmother who just returned from Disney World with my son, daughter-in-law and twin grandchildren, age 7. We had a wonderful time, but in spite of meticulous planning with much reliance on Shannon’s website, we learned some things we would do differently next time. This trip was “my treat” so I went for the whole enchilada — 5 days at the Contemporary Resort, 5 days of park passes, Park Hopper, Water Parks Fun and more, and the Disney Dining Plan that included table service restaurants. For one, we found this was too much food, especially when the resort also provided food and snacks for us. The quick service meal plan would have been better since the servings are amazingly generous and offer lots of variety. Being locked into reservations 180 days in advance for the table service meals limited some of our other choices. We had only a half day to spend at one water park and a half day at Disney Quest, which the kids absolutely loved. Could have spent a full day at each of these, especially Disney Quest. The next time we would try to economize by staying at a villa or Wilderness Lodge where we could prepare some of our own meals and perhaps stay 8-10 days instead of only 5. We went to Cinderella’s Table (our splurge also) and enjoyed it, but unless you have a young princess who just HAS to see Cinderella, this is one to consider passing. Very pricey. We enjoyed Chef Mickey’s and kids had lots to choose from on the buffet. We should have heeded Shannon’s advice to take a break in the afternoons, but were so determined to squeeze in everything that we went non-stop from park openings to evening. As a result, kids were pretty tired by 8-8:30 so we missed most of the nighttime shows like Fantasmic, IllumiNations, and the nightly parades. Fast Pass+ system was a life saver. Rarely had to stand in lines so I highly recommend this. We loved the magic bands since it made everything so easy. Would love to hear other experiences, and also recommendations of off-site locations (like the villa that Carole – previous poster- recommended). Our plan is to go again in two years when kids are 9 and will be able to do even more — assuming that this grandmother will be able also! If you handled all the advance electronic fast passes on your own Dot a high five to you. I am not sure I could handle all that technology by myself. When we went the end of Jan./beginning of Feb. off site visitors couldn’t get fast passes until we entered the parks. It wasn’t really bad though. The only thing that we really wanted to do that we couldn’t get a fast pass for was Soarin’. We got to see/do everything else we wanted. From the various posts and everything I have been reading on this site it seems to me that for DW visitors who have season passes, live within driving distance, etc. and visit DW a few times a year for just a few days each time staying on site is probably the best thing to do. But for those of us who live further away and only get to DW once every few years and stay longer, I think off site is probably best. DW is of course the reason we are there, but it goes beyond that and it is a major vacation for us. We like the villa, particularly with a young child. We don’t have to go to the pool. It is right there. If the adults want to swim when the child/children are in bed they all can be at the pool. Nobody has to stay behind with the children. We didn’t go to the water parks. We had nine full days and we definitely got the Hopper passes. Before we leave home the three adults list the three things we want to do most in each park. That doesn’t come to nine things as some of us want to do the same thing. We don’t actually time everything, but we schedule it so that we can do these things and we list the other things that we want to see or do every day we are at a theme park. I guess we will have to change that a bit now that off site visitors can get fast passes in advance. We originally had planned on one villa day and one side trip day, but we enjoyed the villa so much that took two villa days. Next time we go we hope to stay for two weeks and stay at a villa again. We all love DW, but I especially like having the villa as I don’t live near this part of my family and I only see them a few times a year and I enjoy just relaxing at our own pool, etc. with my family. We had our main meal at the villa half the time and our main meal at DW the rest of the time. To say we “cooked” would be stretching it. We bought pasta and the spaghetti sauce, we bought frozen lasagna, etc. and we had a salad with each meal. Before we even had any of our reservations, my son stated that he would make a big breakfast every day and he did. We didn’t drag our feet, but we didn’t rush either. My son made the breakfast and my daughter-in-law and I set the table, cleaned up, etc. We each just seemed to automatically do whatever had to be done. Again, it worked so well for us but every person and every family is different. It is interesting to hear what others have done staying on and off site and how they planned their days at the theme parks. Thanks for all your tips Shannon. It may not seem that we used them, but we did pick up and use a few of your valuable tips and I love this site. Dot – I am a 58 year old grandma and LOVE your enthusiasm. I hope I’m just as much a Disney nut when I’m your age, and just as giving to my kids and grandkids as you. We’re taking the kids/grandkids in February 2016, and your tips will help as we will have our 5 and 8 year old granddaughters with us. I am the grandmother in our three generations trips to DW. We are a small party of four – me 73, my son & daughter-in-law mid 40s and my six year old granddaughter Claudia. My first DW trip was in 1976 when my late husband and I took our three children ages 11, 10 & 8 to DW which was just the MK then and we fell in love with DW. I have been back five times since then, three times an all adult trip and the last two were three generations trips. We do plan and I have gotten a few tips from you, but we don’t plan in as much detail as you do. I live in Nova Scotia, Canada and my family lives near Montreal so I fly to Montreal to join them for our DW trip and we fly out of Plattsburgh, N.Y. but I won’t go into that now. After a lot of researching, emails and phone conversations we chose to stay off site and again after a lot of researching, emails and phone conversations we settled on a three bedroom, two bathroom villa with a pool and games room for our ten night stay. Yes, we had to rent a car and drive to and from DW but we didn’t mind – we love DW and we loved our villa. It worked well for us. As you know when travelling to another country we have to take the exchange rate, out of country insurance, etc. into consideration. Claudia is in kindergarten so we took her out of schood and we went during value season – the end of January/beginning of February. As she goes into the higher grades we won’t take her out of school and we will have to plan differently. We had an itinerary of what we wanted to see in each park and one dining reservation (our splurge as we call it) the last visit at Cinderella’s Royal Table. Claudia likes all the characters, but she looooves the princesses. I agree with your Mom Shannon – we are not early morning people and we did not head to the theme parks bright and early but going later works too. We have three general rules that we stuck to – 1) We will cater to Claudia, but also do things we want to do as it is our vacation too. 2) Be flexible and 3) Have fun, fun, fun. This is getting too long so I won’t go into detail about what we did and our schedule. But I will say every person and every family is different. Plan what will be best for all members of your family (even when it is cold and rainy during your visit) and have a great time. We had a wonderful time even with cold and rain. It may be a few years, but we will be back again. My other son, daughter-in-law and 17 year old granddaughter are going to DW (&Universal) the end of August. They are staying off site too, but in a hotel suite and they have a schedule different from ours that should work for them. I am excited to see more info regarding grandparents trips. I am presently planning a trip for Memorial Day week 2015 (arriving on Memorial Day not visiting parks that day). Currently, the plan is Myself and husband, Son and friend, Ex-DIL and her new husband, and 2 grandsons who will be 5 & 7 then. Both son and XDIL want to be at Disney for boys first trip. Possibly Daughter, SIL and their 1 1/2 yr old daughter may go along with other Daughter and SIL. We are looking at the Windsor Hills community to rent a house for everyone to share a house with pool, etc. Plans are few days at Disney and 2 at Universal (everyone loves Harry Potter). Have been worried about staying offsite vs onsite.. but your post makes me think I am making the right choice in staying offsite. We are driving down so will have a car. Any advice is GREATLY appreciated! !